Slinging.org Forum - Pumpkin contest! Slinging.org Forum › General › Slinging as a Sport, Competition Rules, Slinging Awards And Events › Pumpkin contest! Halloween is coming and with it, PUMPKINS!!! Let’s all share in this friendly competition. Stand around 15-20 meters from your pumpkin and get some footage of you slinging at it. Most of us a solid chance of scoring some points. I was aiming at a Cup again today and got within a foot’s distance from it a few times. Pumpkin should be hittable. Let’s post our footage and maybe even greate a montage! I'm in. I also wanna make a jack o'lantern comparison. See how ugly we can make a pumpkin head with stones for cutting tools . I guess we're trying to do this before Halloween ?? Well with this amount of contestants at least I get a spot on the podium! I'm going to try this. No promises and of course it might actually have to stop raining for a day to do it. But it sounds great. what did the pumpkins ever do to you ? I'll get petv (people for the ethical treatment of vegetables) on to you ! CA- since pumpkins have seeds they must be fruit so the petv has no jurisdiction on the matter. I hope to see your own video footage of pumpkin carnage!!! PETF - are right bastards compared to the PETV ! You REALLY don't want to mess with the PETF ! And both of those group pale in comparison to Gourds Anonymous. I may have to pull a Sarosh and blur my face if I make a video. Got my pumpkin! It's not exactly a... large pumpkin but size isn't everything. This is supposed to be a challenge anyway and those huge pumpkins would be far too easy! I'm wondering actually how hard it's going to be to smash it. It's pretty dense and heavy so I'm expecting lots of glancing shots. Hopefully I'll crack through it. I might not be able to film the whole session (I am going to miss A LOT) but I'll be sure to count all my shots so I can say how long it takes me to get a good hit. why not have a prize ? Most spectacular pumpkin smash wins. Not most hits or furthest distance - but biggest hit. I want to see blood and brains exploding out the back of the skull ! Video must show you and the pumpkin or be videoed from where you stand. Standing 2 feet from the pumpkin won't count. At least 10 metres from the pumpkin is required. Ooooo interesting. 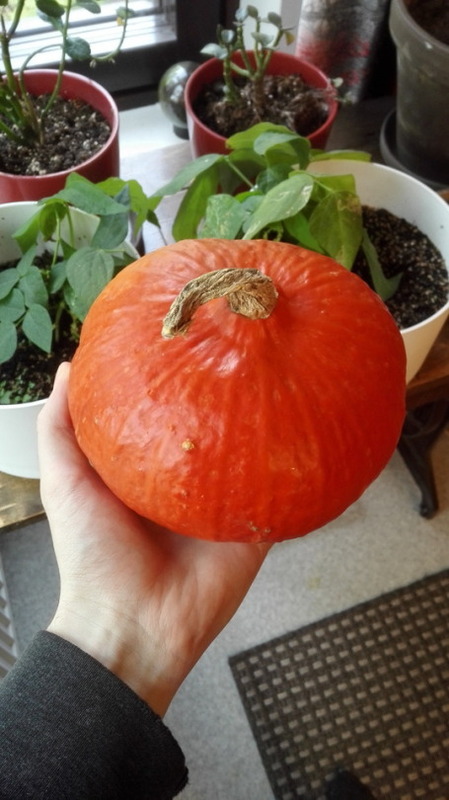 Let's see what I can do with this small pumpkin. Hopefully I an get something spectacular I might be able to use my girlfriend's camera so will be able to film for longer and I can use a tripod so I won't need her standing around in a field getting cold. I'm just praying now it won't rain tomorrow.